He was a native of Yorkshire, and even in his childhood an enemy to the usual amusements of that age, loving only prayer, serious reading, and useful and pious employments. Having finished his studies, he was ordained priest, and instituted to a rectorship of a parish in the diocese of York; but after discharging that office some time with great assiduity and zeal, he resigned that living, and took the religious habit in the Benedictine monastery of our Lady in York. Richard, the prior of this house, and twelve others, desiring to serve God according to the primitive institute of the Benedictine Order, left the monastery, with leave of the abbot, and endeavoring to execute their project, struggled with incredible hardships; till Thurstan, the pious archbishop of York, gave them a desert valley, called Scheldale, with the town of Sutton, where, in the midst of winter, and in extreme poverty they founded the celebrated abbey which, from certain springs, was called Fountains, in 1132. The Cistercian Order, which had been lately introduced into England, and settled at Rievalle, was perfectly agreeable to the fervent dispositions of this holy colony; and at their request the monastery of Fountains was received into it by St. Bernard, who in his letters extols the perfection and sanctity of this new nursery of saints, which, from the beginning, was a model to the whole order for devotion, austerity in fasts, labor, by which all the monks procured their subsistence, fervor in all religious exercises, and cheerfulness in singing assiduously the divine praises. No murmur or sadness was known among them; nor any strife or contention ever heard of, unless of charity or humility: they never yielded to rest, till fatigued with labor; and always came hungry from their slender table, which was chiefly furnished with pulse and roots from their garden. St. Robert seemed so far to eclipse the rest of this holy company by the lustre of his piety, that they all had their eyes on him in their religions duties, and studied to transcribe his fervor in their actions. Ranulph of Merley, baron of Morpeth, paying a visit to the monastery of Fountains five years after its foundation, was so struck with the edifying deportment of the terrestrial angels who inhabited it, that he obtained of the abbot Richard a certain number of those monks, and built for them a monastery called Newminster, near Morpeth, in Northumberland, in 1137, of which St. Robert was appointed abbot. The saint in his new dignity thought it his duty not only to walk before his brethren, but to go beyond them all in every religious observance; and all his virtues seemed to receive new vigor, and a new degree of perfection in this eminent station. His affection to holy prayer is not to be expressed. He recommended to God continually those committed to his care, and with many tears poured forth his soul for them night and day. He was favored with the gift of prophecy and miracles. He founded another monastery a Pipinelle, or Rivebelle, in Northamptonshire, and lived in the strictest union of holy friendship with St. Bernard; also with St. Godric, a holy hermit in those parts, illiterate as to secular learning, but a most spiritual man. 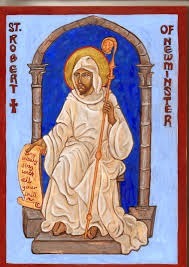 St. Robert finished his course by a happy death on the 7th of June, 1159. Miracles attested his sanctity to the world. He is named in the Roman Martyrology.